Media commentators, scholars, and even the president’s allies have speculated that President Trump might “pardon his way out” of the Department of Justice investigations of potential cooperation between Russia and the Trump campaign and obstruction of justice and of President Trump’s attorney Michael Cohen. This strategy would entail issuing presidential pardons to targets of these investigations in the hope that eliminating their exposure to federal charges will prevent them from cooperating with investigators. Considering the possibility of a pardon strategy is no mere academic exercise. There are many indications that President Trump has contemplated employing it. Last fall, the president’s attorneys reportedly broached pardons with attorneys for former Trump campaign manager Paul Manafort and former Trump National Security Adviser Michael Flynn. This March, immediately following FBI raids to gather evidence from the President’s Trump Organization associate and former lawyer, Michael Cohen, the president issued a pardon to former Vice President Cheney aide I. Lewis “Scooter” Libby, who was convicted of obstruction of justice and perjury charges stemming from an earlier investigation. Many interpreted that pardon as a signal that President Trump is open to clemency for individuals convicted for lying under oath. Such a pardon strategy, however tempting it might appear to the president, is fatally flawed. There are two simple reasons for that. First, receiving a federal pardon will not protect key defendants from exposure to state criminal prosecution (as well as state and federal civil liability). In addition, granting a pardon with corrupt intent or for the purpose of interfering or preventing witness testimony could well expose President Trump to impeachment and personal criminal liability for obstruction of justice or bribery. In other words, pardoning key defendants will only complicate, not resolve, President Trump’s legal predicaments. Presidential pardons do not reach state prosecution. A pardon can wipe away or preempt a federal criminal conviction (or set of convictions), but state authorities, not the president, have the power to pardon state offenses. For this reason, the fact that the targets in the special counsel and Cohen investigations are facing allegations that could lead to state prosecutions means that they may still face criminal liability even if they receive a presidential pardon. The federal protection against double jeopardy does not prohibit successive state and federal prosecutions for the same crime. The constitutional protection against double jeopardy applies only to each sovereign, and the individual states as well as the federal government are independent sovereigns. State protections against double jeopardy are sometimes more expansive than the federal protection; however, they cannot be relied upon to pose a bar to successive prosecutions. Some state double jeopardy provisions do prohibit successive state and federal prosecutions where the federal prosecution has either gone to trial or resulted in a guilty plea; however, state crimes that are sufficiently distinct from the federal offenses tried or admitted may still be brought. A presidential pardon would, moreover, not shield defendants from exposure to federal and state civil litigation, including civil asset forfeiture. While civil litigation is generally less worrisome than criminal prosecution, it brings no shortage of its own worries. Because a pardon would not impact civil litigation related to criminal offenses under investigation by the special counsel, property and other assets owned by defendants could be subject to civil asset forfeiture despite pardons for their criminal conduct. Individuals also could still face civil sanctions such as professional censure, and in some civil litigation settings courts have even found acceptance of a pardon to be evidence of guilt. An obstructive pardon would expose President Trump to additional liabilities. 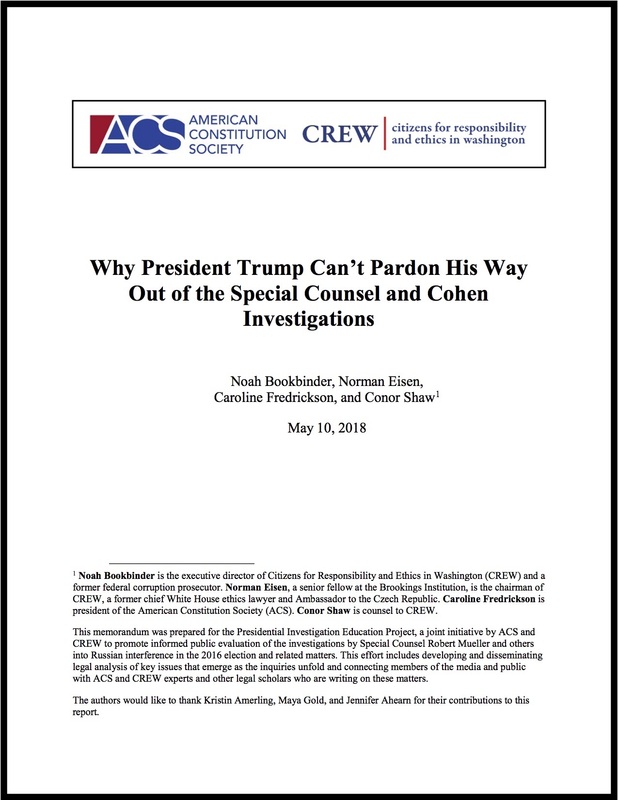 Such a pardon would potentially constitute an impeachable abuse of power for which there is clear precedent in the articles of impeachment drafted by the House Judiciary Committee against President Nixon; it would expose the president to criminal liability for bribery, gratuities, and obstruction of justice for which he could be indicted after he leaves office (and possibly also before); and it could constitute an admission of guilt that President Trump’s campaign, transition team, and/or White House engaged in criminal misconduct.